Mesut Ozil is quitting Germany’s national team following criticism over his decision to pose for a picture with Turkish President Recep Tayyip Erdogan. In a series of statements posted Sunday on Twitter, the Arsenal star announced his retirement from international football. He attacked the German football federation (DFB), its president, fans and the media, criticising what he saw as racism and double standards in the treatment of people with Turkish roots. Arsenal star Ozil bids farewell to German football as a World Cup winner with more than 90 caps to his name. The photo of Erdogan, Ozil and Manchester City’s Ilkay Gundogan meeting in London caused an uproar in Germany two months ago. At the time, the head of Germany’s soccer federation, Reinhard Grindel, publicly accused the players – whose families came to Germany from Turkey – of allowing themselves to be “exploited” by Erdogan for political purposes. Some German politicians questioned Ozil and Gundogan’s loyalty to Germany and suggested they should be removed from the national squad ahead of the World Cup. He also took a swipe at German media who suggested that the 29-year-old midfielder was partly to blame for Germany’s shock group-stage exit from the World Cup. 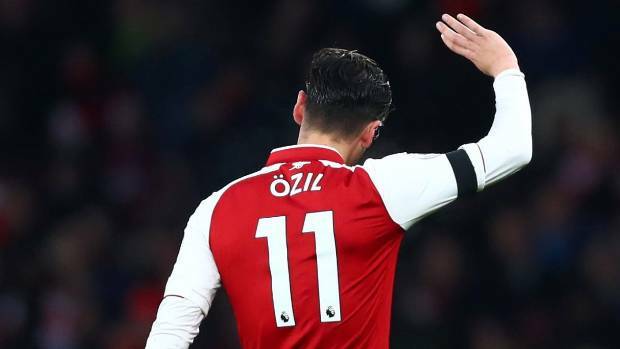 “This crosses a personal line that should never be crossed, as newspapers try to turn the nation of Germany against me,” Ozil said, noting that there had been little criticism of former Germany captain Lothar Matthaeus over a recent meeting with Russian President Vladimir Putin. Ozil reserved his sharpest words for Grindel, however, alleging that the federation president had been “patronising” toward the player, who was a key part of Germany’s 2014 World Cup-winning team. “I will no longer stand for being a scapegoat for his incompetence and inability to do his job properly,” Ozil said, claiming that Grindel had made “unforgivable and unforgettable” comments about immigrants and Muslims in the past. On Twitter, Ozil said: “The treatment I have received from the DFB and many others makes me no longer want to wear the German national team shirt.